Most soldiers are equipped with either 7.92mm Mauser Standard or 7.7mm Lee-Enfield No.1 rifles. The later equips reservists. In 1937 the Army ordered 80,000 surplus Kar 98a rifles, using the 7.92mm Mauser cartridge from Germany. A few Springfield rifles equip the Infantería de Marina. 7.92mm x 57 STPR-36 Radichkov automatic rifle (7.92mm M39/R): in 1939 40,000 rifles were ordered with a repeat order for the same amount in 1940. 9mm ZK 383: Some sixty of these Czech weapons are in use with the Guardia Civil. 7.65mm Steyr-Solothurn S1-100 (7.65mm M32/SGss): Equipping infantry units 120 of these sturdy guns are now in service, the 7.65mm Parabellum cartridge was an unusual choice. These were passed to the Guardia Civil in 1940. 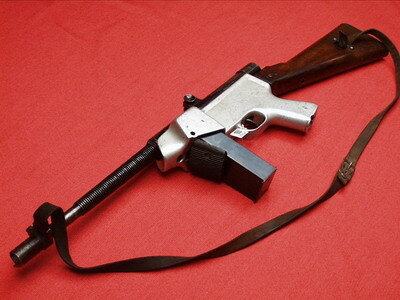 7.65mm MP28 (M28/SGs): Infantería de Marina troops received around a hundred of these guns for the assault troops and use aboard ships in 1928. These were passed to the Guardia Civil in 1940. 9mm Machine Gun Lanchester No.1 Mk I (9mm M37/L): developed by the Sterling Armament Company at Dagenham, Essex. An order for 500 was cancelled in 1935 but post-war the order was re-instated for the Infantería de Marina. In early 1940 another batch of 500 was ordered for the Marines. This gun is 33.5in long, weighs 9.57lbs, rate of fire (cyclic) is 600 rpm and muzzle velocity is 1,245 ft/sec. Thompson M/34: Around 150 confiscated 0.45in Thompson sub-machine guns destined for FUM terrorists are in use with I Division troops. Halcón M-1943: a submachine gun of Argentine origin and is chambered in both 9x19mm Parabellum for the Army and .45 ACP for Police Forces. This weapon is comparable in quality and performance with the Thompson submachine gun. 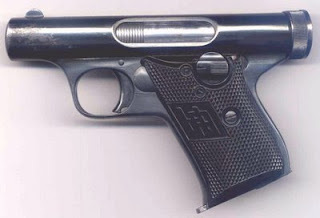 The Halcón M-1943 has a fixed stock protruding from its grip section. It weighs 4.75kg, is 850mm long, the rate of fire is 700rpm with an effective range of 200m. It uses 30/36/40 round box magazines. 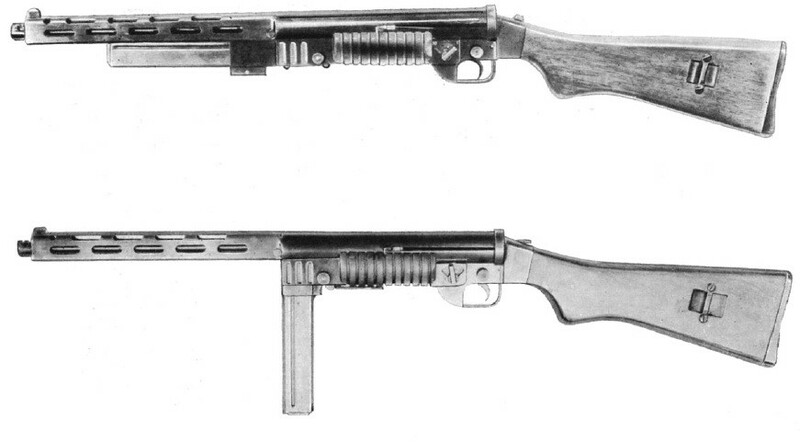 The later Halcón M-1946 came with an under-folding stock. Types in service vary, many officers buy their own favoured weapon but standard issue pistols are the Smith & Wesson M1917 (some 20,000 being brought since 1921) and the Pistola Colt Modelo 1927 (a licensed copy of the Colt M1911A1). Aircrews receive the Browning modele 1910 automatic. Ballester-Molina (.45 M38/BM): The Ballester-Molina was designed and built by the Argentine company Hispano Argentina Fábrica de Automotores SA (HAFDASA). The Ballester was designed to offer the Argentine police and military a less-expensive alternative to the Pistola Colt Modelo 1927, which was itself a licensed copy of the Colt M1911A1 (and was built under the supervision of Colt engineers). Production of the Ballester-Molina began in 1938. As the Ballester-Molina was designed to serve alongside the M1927 it bears a striking resemblance to the Colt M1911A1. The Ballester-Molina and the M1911 share an identical 7-round magazine, barrel, recoil spring, and barrel bushing. Although many other parts appear identical at first glance, they are not. Many parts are adaptable, however. The locking system is a near identical copy to the Colt M1911A1, with the swinging lock that is used to unlock the barrel from the slide. The trigger is single action, two stage, but pivots rather than slides like the 1911 trigger. The hammer is locked by the frame-mounted manual safety, and there is no grip safety. Overall quality is excellent. Weight is 1,130g unloaded and length is 127mm. Criolla (.22 M40/HA): The Criolla is a .22LR calibre semi-automatic pistol manufactured by HAFDASA. The weapon is intended for training purposes and can deflect cartridge ejection either left or right side simply by rotating the bolt around. It has a ten round box magazine. The Criolla pistol is also sold as the Zonda C22 on the civil market. 7.92mm FMG/M32: The Lehky Kulomet ZB vz.30 7.92mm produced under licence. Some 1,650 are in service with the Army. Also manufactured for the air force. 7.62mm Browning Automatic Rifle (BAR) (7.62mm M27/LGb): From 1927 some 1,000 have been brought and some have been fitted with bipods for infantry support. 7.62mm Browning M1919 (7.62mm M26/HGb): Fifty were brought by the Infantería de Marina in 1926 and in 1929 the Mountain Units received twenty-two for infantry support. 7.7mm Vickers Machine-Gun Mk 1 (M20/HGv): Old First World War stock these elderly guns are still the major heavy machine gun in use. About 320 are in service with all branches of the armed forces.